'Pyrmont and the city' is the culmination of numerous smaller plein air drawings in ink and gouache of Pyrmont, an inner suburb of Sydney, which has provided fertile subject matter for Connor since the early 1980s. The drawing shows the area before it was developed, changing in character from semi-industrial to residential, with modern apartment blocks, a casino and recreation areas. ‘It was a wilderness – abandoned old buildings, grass, old stairways and the old railway’ (Kevin Connor, 2003). It also represented a new development in Connor’s oeuvre in the use of white gouache with ink, which accounts for its painterly nature. 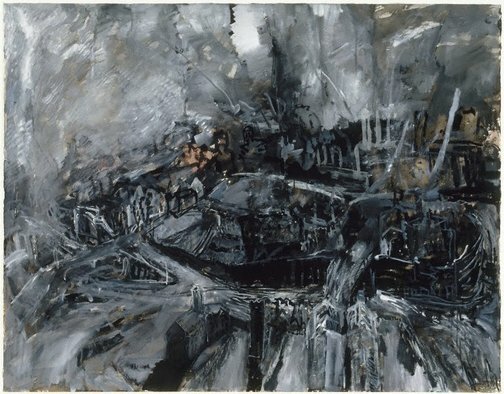 A second related drawing, 'Pyrmont (view to Blackwattle Bay)' 1992 is also in the Gallery’s collection. This work won the Dobell Prize for Drawing in 1993 and was acquired by the Gallery in 1993. Signed and dated l.r. corner, black ink "Connor 9 [illeg.]". Peter Cochrane, The Sydney Morning Herald , ‘Art prizes’ short lists announced’, pg. 8, Sydney, 27 Apr 1993, 8. Elizabeth Fortescue, Daily Telegraph Mirror , ‘Prize drawings on the quirks of fate’, pg. 26, Sydney, 24 Apr 1993, 26. Hendrik Kolenberg, The Dobell Prize for Drawing: 1993-2004 , ‘Introduction: the first ten years’, pg. 8-9, Sydney, 2004, 8 (colour illus., detail), 9, 16, 17 (colour illus. ), 51. Hendrik Kolenberg, Look , 'Drawing a winner: a decade of Dobell prizes shows us how and why', pg. 24-27, Sydney, Aug 2003, front cover (colour illus. ), 7 (colour illus. ), 24. Hendrik Kolenberg, Look , 'Drawing the spotlight', pg. 18-19, Sydney, Jun 2002, 18 (colour illus.). Hendrik Kolenberg, Contemporary Australian Drawing: 20 years of the Dobell Prize for Drawing , ‘Introduction’, pg. 6-14, Sydney, 2012, 6, 20, 21 (colour illus. ), 60. Hendrik Kolenberg, Australian watercolours 1880s to 1990s , 'Introduction: painting in watercolour', pg. 8-16, Sydney, 1995, 11. Hendrik Kolenberg, Look , ‘The first Dobell Prize for Drawing’, pg. 23, Heidelberg, Jun 1993, 23 (colour illus.). Hendrik Kolenberg, Look , 'A fine harvest of drawings: legacy of an exceptional draughtsman', pg. 28-31, Sydney, Nov 2011, 29. Elwyn Lynn, The Weekend Australian , ‘Entries timid, unresolved except in a few cases’, pg. 4, Canberra, 03 Apr 1993, 3-4. Judith Wright, Look , 'Drawing at its best', pg. 15, Melbourne, Mar 1999, 15 (colour illus. ).